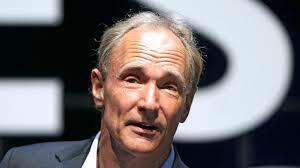 Tim Berners-Lee issued a cri-de-coeur letter and spoke to a few reporters Monday on the eve of the 30-year anniversary of his first paper with an outline of what would become the web — a first step toward transforming countless lives and the global economy. The European Organization for Nuclear Research, known as CERN, plans to host Berners-Lee and other web aficionados on Tuesday. "We're celebrating, but we're also very concerned," Berners-Lee said. Late last year, a key threshold was crossed — roughly half the world has gotten online. Today some 2 billion websites exist. The anniversary offers "an opportunity to reflect on how far we have yet to go," Berners-Lee said, calling the "fight" for the web "one of the most important causes of our time."